Is the GPhC premises inspection process failing on the staffing standard? Through the calls received to our helpline and the information PDA members provide in patient safety surveys, we regularly monitor member concerns regarding working environments and the adverse systemic effect this can have on patient safety. One member provided us with a copy of a recent GPhC pharmacy inspection report, which illustrated some clear opportunities to support a more progressive approach to the regulation of premises, that are arguably being missed due to the process. the inspector had tried personally during the visit to raise the staffing concerns within the company but couldn’t get hold of the relevant people, until finally speaking with someone at head office, who assured the inspector that they would now try to contact the same people to resolve the staffing concerns. Each of the “principles” in the GPhC’s premises standards has various “standards” which form part of it. In this case, although the staffing levels standard was not met, the principle was graded as “satisfactory” by the GPhC meaning: “staff are empowered and competent to safeguard the health, safety and wellbeing of patients and the public”. The pharmacy was graded “satisfactory” overall but was given an action plan in relation to the standard for staffing levels. The action plan produced on behalf of the pharmacy owner said that staff would be given protected training time but that they must ensure they raise requests for cover during periods of absence, which the company would honour wherever it deemed possible. The GPhC is inspecting pharmacies (as part of its routine inspections programme) once every 5 years on average, so typically would not reinspect the pharmacy for a significant length of time. It is unclear why the failure to meet GPhC premises standards may not, in the GPhC’s view, amount to a “direct risk to patient safety”. 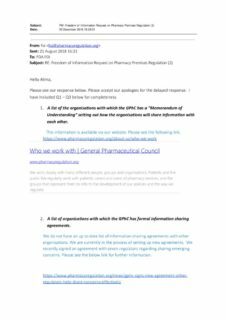 We have repeatedly challenged the GPhC to improve its approach to regulating working environments in the pharmacy (see related links below). During pharmacy inspections since November 2013, the GPhC has given 1,926 satisfactory ratings with an action plan (like the one from our member above).